There are four main channels of psychic communication: clairvoyance, clairaudience, claircognizance and clairsentience. Everyone has some level of ability in each of these areas, but much like the physical senses, some psychic senses are stronger than others. Recognizing how information comes through each of these channels enables you to recognize when spirit guides and angels are sending messages. Then you can acknowledge and accept the guidance, and, most importantly, act on it. It’s not necessary for the images to be clear and distinct. Sometimes, you will get only an “impression” in your mind’s eye. That still counts. If you are thinking about a song, or have it stuck in your head as an “earworm,” then consider its significance. It might be a message. Clairaudient messages from your guides and angels will always be positive and beneficial to all. They are not harmful or toxic, and clairaudience is not a mental illness. With Claircognizance, it can be difficult at first to distinguish whether what just popped into your head is a claircognizant message or your own thought. With practice, you will be able to tell the difference. I find that claircognizant messages have a neutral feel to them. They tend to be presented in the second or third person, present or future tense. They have no emotional charge when they are delivered, though the message can make you feel emotional after you receive it. to energy and can feel air pressure changes around them that indicate spirit presence. Clairsentience can make the hair stand up on the back of your neck when there is a presence around you. 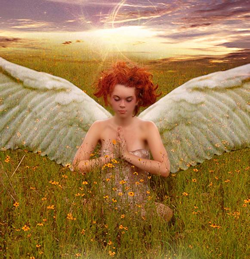 When it’s your guides or angels around, it’ll feel like a loving, comforting presence. In my experience, the nauseated feeling usually appears if I’ve entered a room where someone has passed from an illness. Experience will tell you if this is the case for you. It can be difficult to interpret some of the signs that one gets, so it is perfectly okay to ask the angels or guides for clarification. Each mode of communication has its own unique challenges that are overcome with practice and experience. Regardless which of the four channels of communication is the strongest for you, you should always be aware of the other forms. People receive messages through every type of psychic sense; much would be missed if only one sense became the sole focus. After all, you wouldn’t limit yourself to only one of your physical senses. Virtue, Doreen PhD Divine prescriptions: Using Your Sixth SenseSpiritual Solutions for You and Your Loved Ones, New York: St. Martin’s Griffin, 2000. Virtue, Doreen. How to Hear Your Angels, California: Hay House Inc., 2007.